Looking for a less expensive, less-bloated, less Microsoftian alternative to MS Office? Papyrus Office 11 incorporates a first-rate word-processor with integrated spreadsheet capabilities and a relational database including an intuitive user interface for instantaneous searches. For many users, Papyrus should prove a perfectly satisfactory alternative to the Microsoft behemoth. The latest version 11.27 upgrade was released this month. Papyrus has been around in a German language Windows version (as well as TOS and OS/2 Warp variants) for twelve years, as its version number (11) attests. Consequently, it's mature software. Papyrus Office has been ported to an English language OS X version and is ready to confront the colossus of production software on the Mac platform. The developers' stated philosophy is to make your work as simple as possible by providing carefully selected, powerful features in a ergonomic package while avoiding useless bells and whistles. "Adding 'more' can quickly become 'too much' - except for those people who earn money on bulky and slow Office software (generally, people who offer training seminars or sell expensive new computers)." 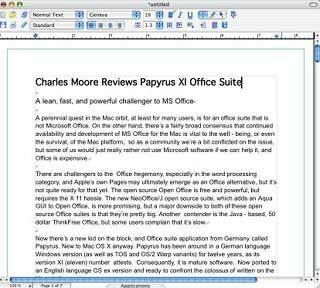 As with MS Office, the core application of the Papyrus Office suite is a word processor called Word, which in this case also incorporates an integrated spreadsheet function. There is also a relational database called Papyrus Base. Papyrus Base uses XML format to store data, allowing multiple (networked) users to operate on (and change) a single database all at the same time. Base has powerful search functions, full-text database search, and document management via integration with Papyrus Word, supporting creation of serial (mail merge) letters and reports. If you're a regular Miscellaneous Ramblings reader, you've probably noticed that I'm something of a fan of German software, which seems to be typically efficiently coded, making for small, lean, fast, very precise feeling and responsive applications. I'm a longtime user of the iCab browser, the DEVONthink desktop database and information manager programs, as well as SILVERfast server software. Not German, but still North European (Norway) is my current favorite browser, Opera, which shares similar characteristics. The compressed download file for Papyrus was only 3.9 MB, bolstering my optimism that this would prove to be another compact Teutonic powerhouse application. Unstuffed, the the Papyrus 11.27 application folder is a svelte 9.4 MB (actually down .4 MB form the previous version I downloaded last summer). Papyrus requires just 2 MB of RAM when fully loaded. Installing Papyrus is simple. Just drag the unstuffed Papyrus folder to any location on your hard drive, and then copy the registration papyrus.key file you receive via email into the new folder. Make sure to keep a backup copy of your license serial number and the papyrus.key file. The operative questions many prospective users of MS Office alternatives ask will be how does it handle the inevitable MS Office formatted documents you throw at it, and how well does it export documents in MS Office format? Papyrus opened the MS Word documents I tested with formatting fully intact and can save documents in its native (*.PAP) format, as well as RTF, DOC (Word), and HTML files. Word documents open without drama simply by dragging them to the Papyrus icon in the Dock, and you can also set your OS X Finder preferences (in the document Get Info dialog) to designate Papyrus as you default .doc document application (either globally or individually) for double-clickable document opening. Database forms and generated reports are Papyrus Word documents. Form letters can be generated by combining a Papyrus Word document with a Papyrus Base database. This technique can also be used for automated literature indices for bibliographies. Papyrus can handle very large documents (even ones with thousands of pages) and large numbers of embedded graphics, and it supports multiple (separate) regions within a document. With this feature, you can make parallel changes to separate regions all at once. You can also use drag & drop with discontinuous blocks. The program's full-text database search engine supports narrowing the search parameters with each change to the expression (even as you type each letter). Type whatever you remember that matches any field in the record you are looking for. With each typed character Papyrus refines the search result, so that you can find the record you are looking for quickly. In addition, you can activate the "phonetic" option, so that variant spellings ("Schulz" =< "Schultz"), accents ("á" = "a"), or (German) umlauts ("ä" = "ae") don't get in the way. Papyrus starts up very quickly, even on my now low-end 700 MHz G3 iBook. When you start Papyrus, the documents and/or databases you were working on when Papyrus was last closed will automatically be reopened. If there was no document open when you closed Papyrus, you will be shown the file selector, allowing you to choose a file to open. The Papyrus user interface is quite attractive to my eyes. The icons and color scheme remind me of the SILVERfast SE scanner software, so perhaps it's reflective of a Teutonic aesthetic sense that I find appealing. Icons are sensibly arranged and clearly (or at least intuitively) labeled. One interface element I was less than smitten with is the individually formatted pages as you scroll through a document. This motif dates back the the old MacWrite word processor and has also been used in ClarisWorks, AppleWorks, and Mariner Write, so it's not unique to Papyrus. It is, in fact, traditionally Mac-like. Personally, I prefer the old MS Word convention of a continuously scrolling document with vestigial page break markers, but that's just my taste. I work mainly with plain text and find page formatting in my drafts distracting. Papyrus responds quite smoothly and smartly for the most part. One exception, especially with larger documents, is scrolling, which is slow and distinctly un-smooth, at least on my slow Mac with its modest Radeon 7500 video support. This may also be an artifact of the port from Windows, since I've noticed poky scrolling in other Mac software ported from Windows. I don't want to belabor this point overmuch, because it will probably be a lot less of an issue on faster machines, and in general Papyrus is satisfyingly Mac-like with its Windows ancestry well hidden. A particular example of the care and attention to detail that's been put into bringing Papyrus to the Mac is the online Help files, which are comprehensive, clear, and readable - and thoroughly Macified. It would be nice if Papyrus became popular enough that Pogue Press/O'Reilly would release a "Missing Manual" for it, but the online version should walk you through the workings of the program satisfactorily. The Help menu includes a table of contents, general help, and a list of keyboard shortcuts. Important elements of the online help are the hyperlinks provided in each document. By mouse clicking you can jump to a related part of the online help and always return to where you started from by using the "Back" entry of the contextual menu (right mouse button or Control click). The Help system is designed to make intensive use of hyperlinks. Additional help is provided by the Tutorial and Assistants, which may be opened from the Help folder. Personally, my main interest in office suites is the word processor. I've never really gotten into using spreadsheets or relational databases, and while perhaps I'm missing out on something, I've never felt the lack. Indeed, even for word crunching these days a text editor serves most of my needs admirably, but back in the day I did used to work more frequently with formatted documents, and indeed word processing remains one of the elements of the fundamental triad of functions most people use computers most often for, the other two being Web surfing and email. Papyrus is a powerful program with a rich and comprehensive feature set. It would take a very long article just to catalog and briefly describe all of its functions, but here are a few examples that I found particularly interesting. 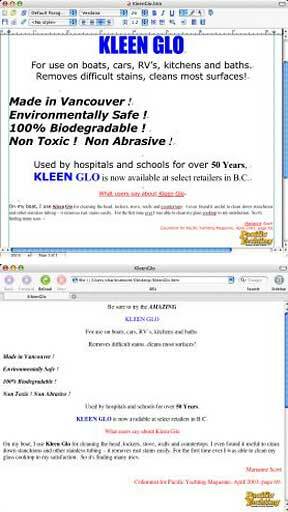 Contextual Menus and "Mummify Text"
Papyrus makes extensive use of contextual menus. Whenever you want to execute a special operation for a certain element in your document, a right mouse click on the element will open a menu offering a selection of commands corresponding to the chosen element. For example, if you right-click on a graphic, you will see commands for color, fill pattern, line styles, etc. To aid in editing your (or someone else's) text, Papyrus makes it possible to delete text passages provisionally, allowing you to recover the text later. Mark text you want to delete and select the option "mummify text" (from the contextual menu). This will remove the text and store it in a holder, which the developers call a "mummy" (partly because of the Egyptian history of the word papyrus). A symbol appears as a small red flag with a black plus sign. The text within the "mummy" is displayed as tooltip-help when you hold the mouse over the symbol. The mummy saves text only - no formatting or text styles are saved. If you recover the text contents, they are restored to the document with the attributes that apply to the mummy's location. By double-clicking on the symbol, you may display and even edit the mummy contents in their "deleted" condition. A master page is a template that organizes regularly reappearing elements of the page layout like columns, page numbers, and captions in header/footer areas, so that the layout is consistent and reusable. You can add background pictures to master pages (which makes a difference to global, document-wide background pictures which are possible, too, by using the Background Picture page of the Document Properties notebook). Multiple master pages with different layouts may be used within one document. Papyrus offers true WYSIWYG (What You See Is What You Get) tables including calculation functions so you can include spreadsheet functionality directly in the document. Papyrus has no dedicated spreadsheet mode - all spreadsheet/calculation features are embedded in the word processor. Papyrus allows a maximum paper size of 9 x 9 meters (about 354 inches - 29.5 feet! - in each direction), which should be enough for most users' needs. 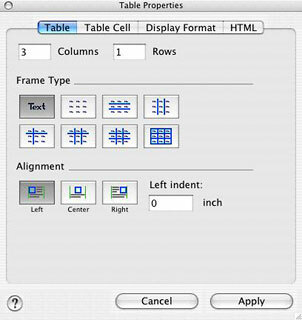 Papyrus's poster printing feature makes it easy to print huge tables even on normal legal, letter, or A4 size printers. The WYSIWYG concept applies to Papyrus documents saved as HTML files. Just compose the document in Papyrus and then save them as HTML pages. With Papyrus' HTML features, it's possible to keep your Papyrus documents optimized both as text and as HTML without tedious reformatting, and you can import and process existing HTML documents in Papyrus. Existing code will be changed only if absolutely necessary, and unknown tags will be left untouched. I tried converting a heavily formatted MS Word file to HTML, and Papyrus did a very decent job of it, including maintaining the graphic content. 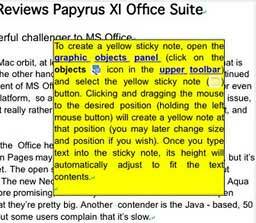 Papyrus Word's Sticky Notes feature lets you create notes or remarks in your documents. You can paste these labels anywhere in a document, automatically be marked as non-printable in default yellow. The Text Styles dialog page allows you to save frequently used text style settings so that you can reuse them without having to set every attribute manually each time. 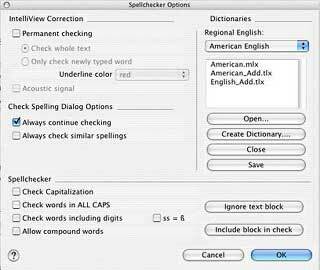 The Spell Checker Options dialog contains settings for Papyrus' IntelliView spell checking and correction system. Papyrus Office is a self-contained executable, permitting it to run even from (fast) removable media (such as USB memory sticks) - a feature that reminds me a bit of the old "minimal install" option with old MS Word 5.1. 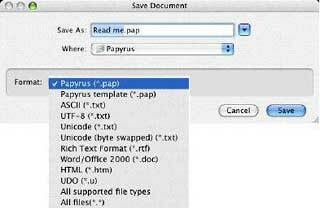 You can take Papyrus (and your data) with you and use it on any Mac (or Windows) computer. Remove the memory stick, and you leave the system untouched. Papyrus is available as a free demo to check out before committing any cash. Since it's so small, this poses no hardship, and Papyrus may turn out the be the MS Office alternative you've been looking for - or just a great productivity app in its own right. System requirements: Papyrus Office for Mac is completely compatible with Mac OS X 10.2 or newer (Jaguar, Panther, and Tiger). Papyrus Office 11 (English) - Word processing, spreadsheet, desktop publishing, and relational database software, including online help and English-language example files, shipment via Internet download; for Windows 9x-XP, Mac OS X sells for $99 or 99€. Crossgrade or student orders (check conditions on website) are entitled to a discount of $20 or 20€. A downloadable demo of the program is free. Multiple user licenses are available. Papyrus Office is shipped via Internet download. Users receive a license key via email, including instructions on how to download the complete package from our Internet server.